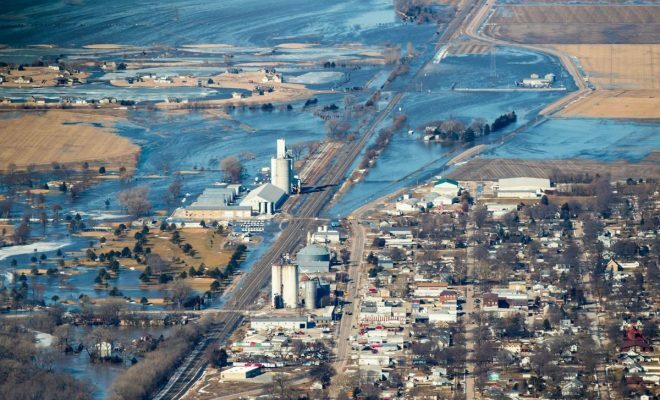 At least three people are dead, thousands have been evacuated, millions are under flood watch, and many farm operators have lost their livelihoods after last week’s “bomb cyclone” storm brought massive flooding to much of Nebraska, western Iowa, and parts of Wisconsin and South Dakota. The impact was visible from space, with Copernicus, the European Union’s Earth Observation Program, describing the flooding as “biblical”. “41 locations set new record river crests in six states. Most Missouri Valley tributaries are seeing river levels fall, but it will take a bit longer for the Missouri River, itself, to fall” in Nebraska and Iowa, tweeted The Weather Channel, which blamed the flooding on “a perfect storm of meteorological factors” including the bomb cyclone. In Nebraska, “the record floods that have pummeled the Midwest are inflicting a devastating toll on farmers and ranchers at a moment when they can least afford it, raising fears that this natural disaster will become a breaking point for farms weighed down by falling incomes, rising bankruptcies,” and the fallout from Donald Trump’s trade wars, the New York Times reports. The Express in London, UK reports that floodwaters cut off the Cooper nuclear facility near Brownville, NE, the second time in seven months that a severe storm has put a U.S. nuclear plant at risk. Operators were forced to fly in supplies and personnel by helicopter. One-third of Offutt Air Force Base, home of U.S. Strategic Command, was also stranded.